Dimples & Dragonflies Studio & Gallery LLC: Say What? Say What? 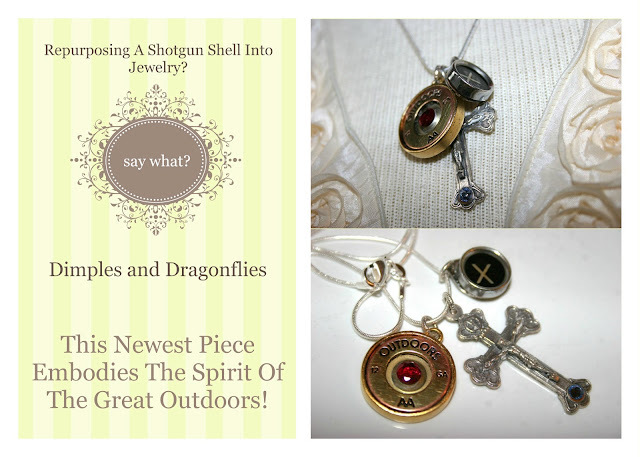 A Shotgun Shell Repurposed Into Jewelry? I Thought The Same Thing Until I Saw Some Pieces Other Jewelry Artists Had Designed. So I Decided To Try My Hand With One. I've Bezel-Set The Top Portion Of A 12 Gauge Spent Shell And Added A Beautiful Ruby Gemstone Directly Into The Center. Afterwards, I Joined It With A Sweet Crucifix Which Has A Pretty Blue Spinel Stone Directly On The Bottom. Lastly, I Soldered An Authentic Typewriter Key To A Teardrop Shaped Nickel Base, And Suspended The Trio From A Sterling Silver Snake Chain.